Josh "FuzzyChef" Berkus works out of The Clay Underground in San Francisco. He makes functional pottery so that people can fit art into their regular lives, and because throwing on the wheel is fun. Josh has a Bachelor's in Art from Pitzer College, where he studied with Paul Soldner. He has been working with clay for over 30 years. Josh is an avid food geek, former professional baker, and amateur chef. As a result, a lot of his pottery centers around the preparation and consumption of food, including items he designed to help with his own cooking. He is also a coffee fiend, leading to a large selection of mugs and espresso cups. 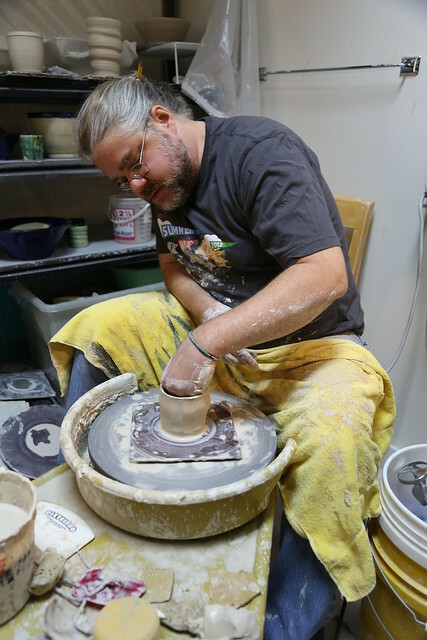 All FuzzyChef pottery is handmade by Josh, either thrown on the wheel, constructed from slabs, or assembled from press-molds of original artwork. Most of the glazes used on the work were hand-formulated, including several glazes which are original recipes. Josh is continually developing and testing new glazes. 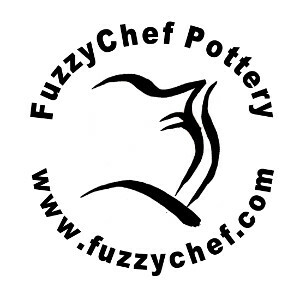 As a rule, FuzzyChef pottery is fired to 2200 F. (Cone 6), making it safe for use in the oven, microwave or dishwasher. However, use on the stovetop, repeated freezing, or rapid temperature change are not recommended as they can cause fractures. Glazes on interior surfaces are tested not to leach toxins so that they can be used with food. Non-functional pieces which are not safe for food or kitchen will be clearly marked in the item description. Contact him at using the contact form if you have additional questions, or follow his blog or his twitter account.